How many times do you think, “Oh, if only dinner was already made. We all get in that position sometimes, especially if you are a working Mother, Housewife or Father in charge of meals. One solution to this is to take a couple of hours over the weekend and prepare a few meals ahead of time. There are many food items that can be prepared in advance and stored in the refrigerator or freezer. And while you are busy preparing these food items, did you know that it doesn’t really take any longer to make double the quantity. Half can be for current meals and the other half can be wrapped and frozen for use at a later time. Our dinner tonight was Cheese and Mushroom Enchiladas which I made yesterday and refrigerated for heating tonight. Since there were only two of us eating dinner tonight, we did not need the dozen Enchiladas that I could have made from the recipe below. What I did was to make six Enchiladas for dinner tonight and with the remaining ingredients, I made a stacked Enchilada Casserole. The ingredients were the same, but the assembly was much simpler. When we do eat the Casserole, I will marinate and grill some Shrimp to go with it. Shrimp only need to be marinated for about 15 minutes (never longer than 20 – they will get mushy otherwise). For tonight’s dinner, I made mexican-rice/ and a Green Salad with Thousand Island Dressing to go with the Enchiladas. 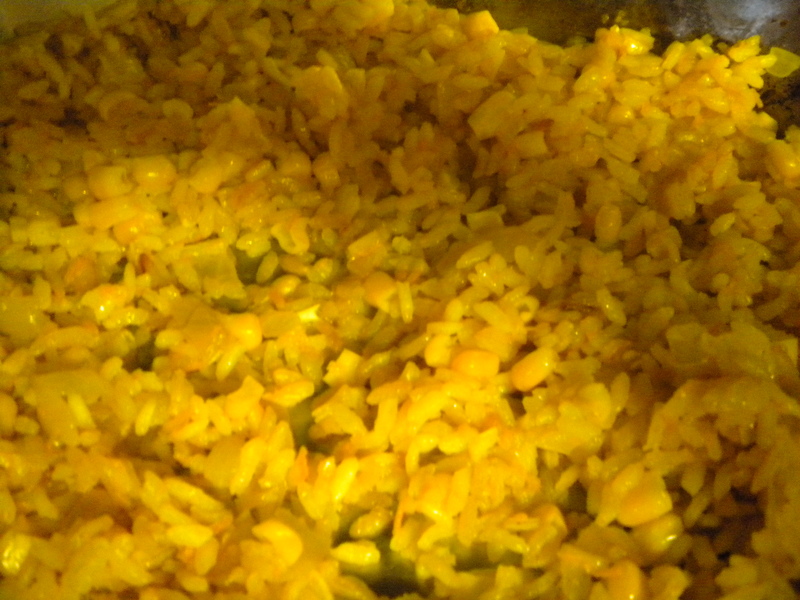 Mexican rice is simple to make and only takes about 20 minutes to cook. Enchiladas can be made from Chicken, Beef, Cheese or even Seafood. If you have leftovers from a roast or chicken these can be utilized in the Enchilada Production. 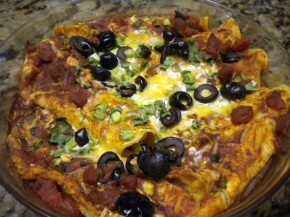 The recipe below is for Cheese Enchiladas, but you can certainly substitute almost anything else that you wish. You can either use the Sauce recipe or you can purchase canned Enchilada Sauce. The Sauce Recipe below will actually make more than you need for the Enchiladas you will make. You can freeze the leftover sauce and defrost and use it another time. Shred the Cheese and mix together; place in a bowl. Wash, dry and slice the Scallions into very small pieces; place in a small dish. Drain the Olives and slice thinly; place in a small dish. Heat the Enchilada Sauce just to warm it. Dip each warm Tortilla in the warm Enchilada Sauce; coat both sides well. Add half the sliced Olives and Scallions to the Shredded Cheeses; divide the mixture among theeight Tortillas. Lap the sides of the Tortillas over the Cheese Filling and place each of the Enchiladas, lapped sidedown in a greased, shallow baking dish. Garnish the Enchiladas with the remaining Olives and Scallions. Bake in a 350 degree oven for 20 minutes or until the Cheese is melted. If desired, additional Cheese can be spread over the top of the Enchiladas before baking them. * You can eliminate this step and just soften the tortillas in the sauce. Using a 2 quart saucepan, cook the Garlic and Chili Powder in the Hot Oil with 3-4 Tbsps. ofthe Chicken Stock. Stir constantly over medium heat for 3-4 minutes; be careful not to burn theChili. Stir in the Tomato Paste, remaining Chicken Stock Oregano, Salt and Sugar. Simmer about 15 minutes, then stir in the Cilantro. This Sauce may be refrigerated for several days. * Commercial Enchilada Sauce may be used instead.